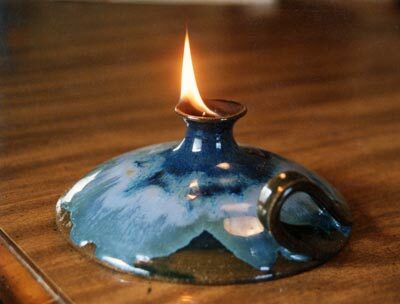 To order a Dancing Flame Oil Lamp handcrafted by June Keener Wink please call 413-258-4243 or e-mail junewink@gmail.com. The year 2015 has been a year of ordinations in Franconia Conference. We’ve been celebrating and marking commitments and calling nearly every six weeks . . . Mike Ford at Blooming Glen, Joe Hackman at Salford, Donna Merow at Ambler, Angela Moyer at Ripple, Kris Wint at Finland, Josh Meyer at Franconia, Samantha Lioi at Whitehall and Ubaldo Rodriguez at New Hope Fellowship in Baltimore for mission work in the Philippines. Ordination is an ancient process of setting apart leaders for public ministry in the way of Jesus. 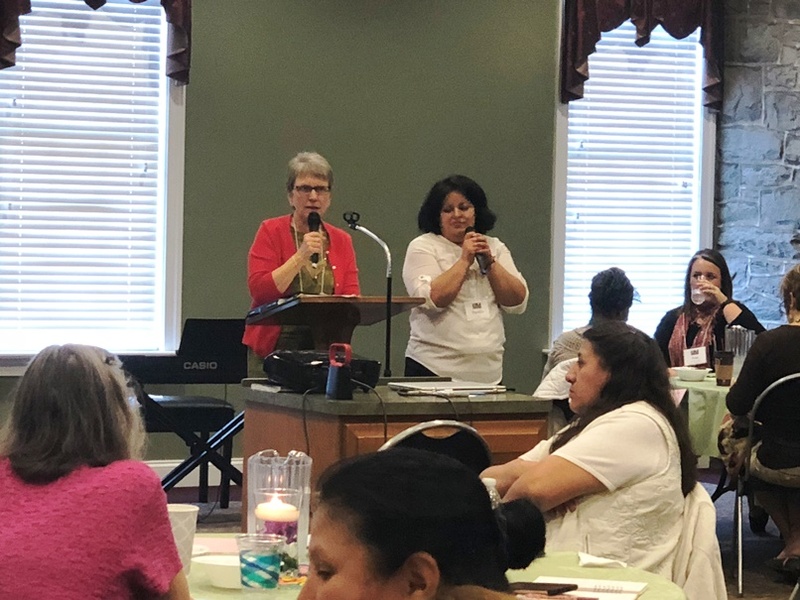 Within Franconia Conference, we follow a set of procedures that seek to honor both the individual and the community while respecting the work of the Spirit within both settings. There is coursework for completion, interviews, paperwork that intends to keep our communities both safe and accountable, mental wellness assessments, varieties of continuing education and varying levels of mentoring. Some of our pastors breeze through the process at a steady and assured pace in the two year minimum waiting and working period of licensing. Others take much longer to plumb the depths of call both personally and communally and to wrestle it out. Personal disclosure, it took me six years of working, waiting and wondering in Allegheny Conference before I could wrap my head around the commitments and calling that ordination entails. We take this process seriously yet the days of ordination have a more celebratory tone. 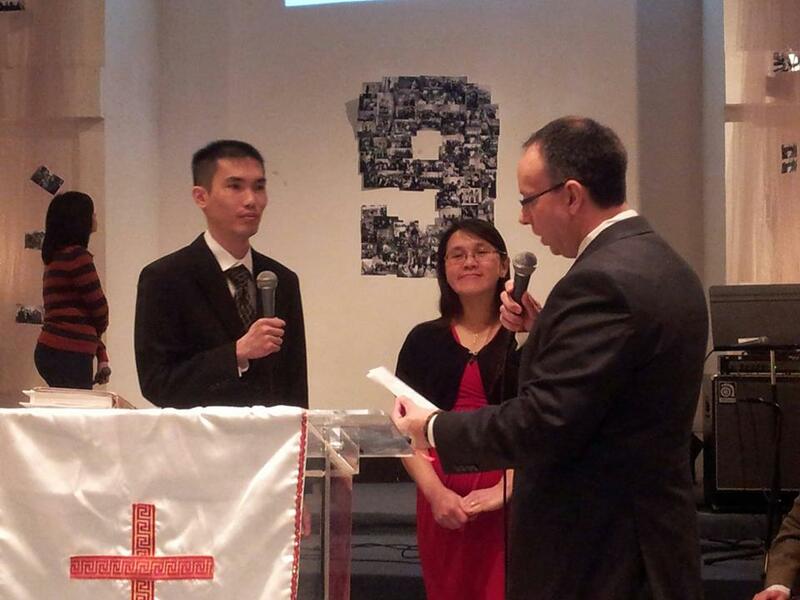 There are few times in our lives when we make commitments that will shape our life like ordination. In front of a gathered congregation at the request and affirmation of a particular Christian community, we make commitments to serve, lead, pray, study, turn from evil and live into the role of Christian leadership as long as God sustains. Many of us wrestle with the meaning of ordination. I’ve found this human and historic process of calling, recognizing, working and wrestling and receiving becomes quite holy. Somewhere in the wrestling and symbols, the questions and the mundane of the paperwork, the Spirit unfailingly shows up. In this flurry of ordinations in the midst of a turbulent time, I am confident that the Spirit is still at work with us, trying to bring life. Each person who says yes to the invitation of God and the community strengthens the possibilities of future “yes” responses into the next generation. This round of ordinations represents our first millennial generation ordained ministers, our first Italian American woman, our first ordination for mission work in the Philippines. We’ve called at some of our most historic congregations and our newest. The churches are rural, suburban and urban. We’re recognizing the sons and daughters of historic Franconia Conference families, as well as persons who were drawn to Mennonite congregations by conviction, relationships and call. We’ve held events in Episcopal and Lutheran facilities and even at a Lancaster Conference church in Baltimore. (Interesting side note, a Lancaster Conference African congregation recently used the Towamencin meetinghouse for an ordination worship). It’s definitely a different time. The ordination process isn’t what it used to be. There’s no somber ceremony with Bibles or hymnals and a slip of paper as in Mennonite history. But the holy moments remain, those wonderful spaces where community and Spirit commingle to cultivate surprising invitations toward ordination and wonderfully amazing continued responses of “yes I am willing.” Every time we ordain, it’s a sign that the church will go on. And in these days of turbulence and questions both in the church and in the culture around us, every yes somehow feels miraculous. And I’m grateful to get to witness it as the Good News still breaks upon us. . . this year about every six weeks. 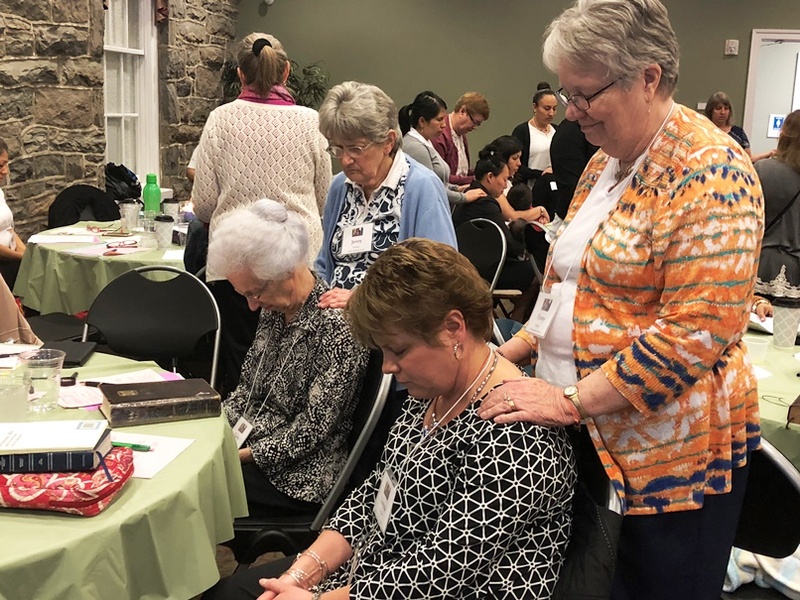 Many Christian congregations commemorate the coming of the Holy Spirit on Pentecost Sunday, and three Franconia Conference congregations in particular acknowledged the Spirit’s movement through the credentialing of leaders for ministry. On June 8, all occurring in southeastern Pennsylvania, Donna Merow was ordained and Danilo Sanchez and Phil Bergey were licensed for ministry. 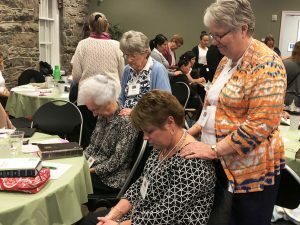 Their credentialing brings the number of credentialed leaders in the conference to approximately 160 men and women serving in at least seven states and four countries. Merow was ordained for pastoral ministry at the Ambler congregation, where she has pastored for more than four years. LEAD minister Jenifer Eriksen Morales led Merow’s credentialing. Merow chose to be ordained on Pentecost Sunday after discovering she was confirmed in the United Methodist church on Pentecost 40 years prior. 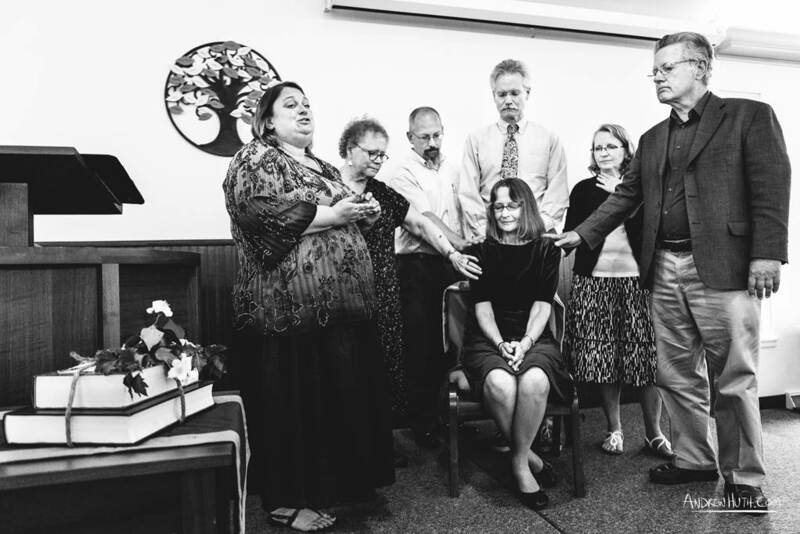 LEADership Minister Jenifer Eriksen Morales and members of the congregation pray at the ordination of Donna Merow (seated center), pastor of Ambler Mennonite Church. Photo by Andrew Huth. Merow was only 12 when the possibility of religious vocation was first suggested to her. Between now and then, she “worked at a church camp, dropped out of college, cared for blind students, got married, and raised two daughters.” She has also been an active participant in churches from several denominations: Methodist, Baptist, Episcopalian, Presbyterian, and Mennonite. Sanchez was licensed for youth ministry among multiple Anabaptist congregations in and around Allentown. LEAD minister Steve Kriss led the credentialing. Sanchez is primarily working with Whitehall and Ripple, both Franconia congregations, by leading music or teaching children, but is also working alongside Karen Fellowship (independent), Iglesia Menonita Evangelica Restoracion (Lancaster Conference), Christ Fellowship (Eastern District Conference), and Vietnamese Gospel (Franconia Conference). Sanchez said his licensing felt like an important personal and professional step because many people and institutions, including Franconia Conference and Whitehall, “are recognizing my gifts and willing to walk alongside me as a pastor.” Sanchez, grew up in the Boyertown congregation and has interned with both Souderton congregation and Philadelphia Praise Center while a student at Eastern University. He graduated from Eastern Mennonite Seminary last year with a Master of Divinity degree. 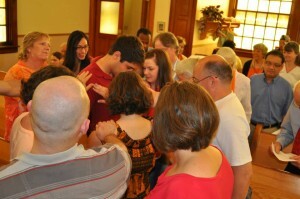 Members of Whitehall Mennonite Church pray over Danilo Sanchez. Photo by Patti Connolly. Bergey was licensed as interim lead pastor of the Blooming Glen congregation, where he has been a member for about 20 years. Ertell Whigham, executive minister of Franconia Conference, led the credentialing. 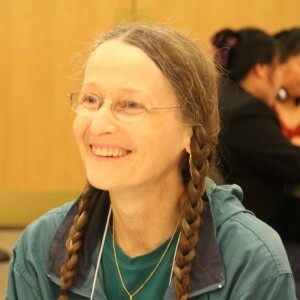 Bergey is former conference executive of Franconia Mennonite Conference. 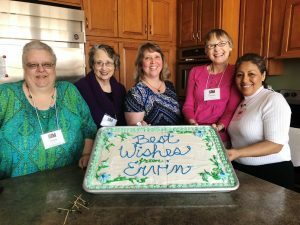 In the wake of Firman Gingerich’s resignation as Blooming Glen’s lead pastor, the congregation’s board invited Bergey to assume a part-time interim lead pastorate. The congregation is searching for a long-term pastor. Phil Bergey, interim lead pastor of Blooming Glen. Bergey preached the morning of his licensing, focusing on the story of Abraham and Sarah in Genesis 12. He framed the commencement of his pastoral leadership and the pastoral search processes not as the beginning of a journey but the continuation of a journey. That journey, he said, includes the history of the Blooming Glen congregation, the Anabaptist tradition, and the Christian church, going all the way back to Abraham and Sarah. Hadi Sunarto was licensed as a deacon at Philadelphia Praise Center in March. Hadi Sunarto (East Rutherford, NJ) was approved for a license for specific the ministry of deacon at Philadelphia Praise Center. Krista Showalter Ehst (Bally, PA) was approved with a license toward ordination to serve as pastor at Alpha (NJ) Mennonite Church. Bill Martin was approved with a license toward ordination and to serve as associate pastor at Towamencin Mennonite Church. Danilo Sanchez (Whitehall congregation) was approved to serve as Allentown area youth minister with a license toward ordination. Donna Merow was approved for ordination and continues to serve as pastor at Ambler (Pa) Mennonite Church. Several new members have been added to the Ministerial and Credentials committees. Mike Clemmer (Towamencin) and Marlene Frankenfield (Salford) have been named to the Ministerial Committee. Heidi Hochstetler (Bally) resigned her position from the committee earlier this year. Continuing Ministerial Committtee members include: Verle Brubaker (Swamp), Ken Burkholder (Deep Run East), Carolyn Egli (Whitehall), Janet Panning (Plains), Mary Nitzsche (Blooming Glen), Jim Williams (Nueva Vida Norristown New Life). Aldo Siahaan (Philadelphia Praise) and Marta Castillo (Nueva Vida Norristown New Life) have been named to three year terms on the credentials committee. Continuing committee members include: Rose Bender (Whitehall), Verle Brubaker (Swamp) and Mike Clemmer (Towamencin). 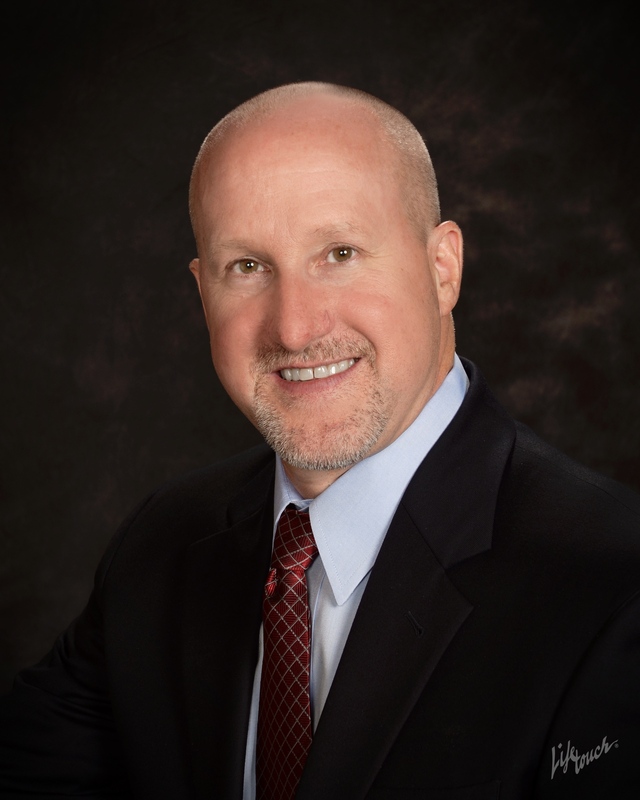 Steve Kriss began serving as Conference staff liaison for both committees since the retirement of Noah Kolb late in 2013. Steve Kriss (top right) and Derek Cooper (second row, fourth from the right) have partnered for five years to take seminary students on intercultural learning trips, including this spring’s trip to Vietnam and Cambodia. Photo by Dennis Dong. Theological educators believe headfirst immersion into unfamiliar cultural terrain is a requirement for preparing church leaders in the context of the twenty-first century. 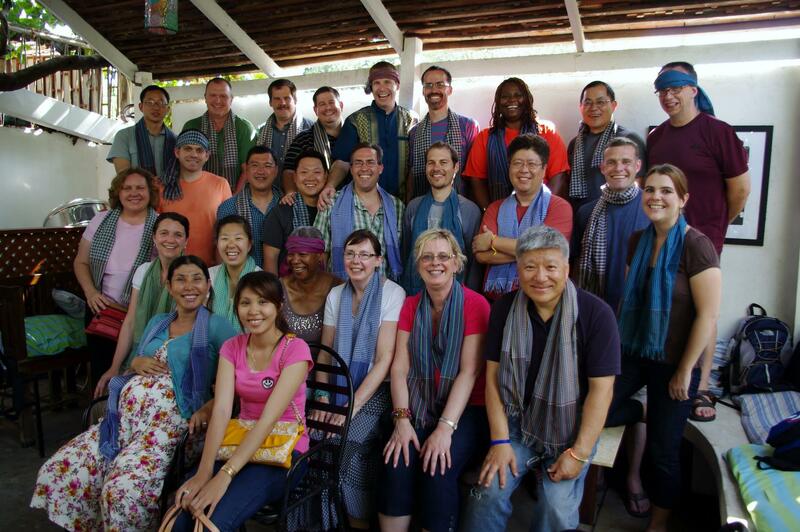 For students at Biblical Theological Seminary (Hatfield, Pa.), a lifelong commitment to intercultural ministry begins at the second year mark of their LEAD Master of Divinity Program. To meet the complex and unconventional demands of intercultural education, Biblical Seminary and Franconia Conference have partnered together to create the Intercultural Ministry Experience (IME). For the past five years, Franconia’s director of leadership cultivation, Steve Kriss, and Biblical’s director of the LEAD program, Derek Cooper, have led a total of seventy-five students on journeys far and wide, from Israel/Palestine to Italy to Cambodia and Vietnam. 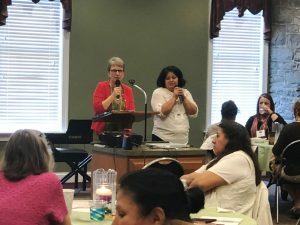 “We also talk a lot about contextualization, and we learn much about how the local Christian community addresses issues relating to history, culture, politics, and world religions,” Cooper added. The live nativity at Towamencin congregation. Photo by Casie L. Allebach. Christmas. I have long been ambivalent about this holy season. Don’t get me wrong. I LOVE Christmas—the anticipation of Advent, the children’s pageant, singing “Silent Night” by candlelight with guitar accompaniment, the live nativity, the retelling of the familiar story, the making and wrapping of gifts. I trace my ambivalence to singing “Will Santy Came to Shanty Town?” for a school program when I was about nine. The song is a child’s first person wondering if Santa will visit his side of the tracks this time around or if his mother will have to repaint his toys the way she did the year before. At the time I needed to believe in the magic of Christmas more than anything. My parents had recently divorced, which necessitated a move, and my world was turned upside down by the addition of a stepfather who drank too much. But Eddy Arnold’s musical autobiography captured my youthful imagination. The revelation that Santa apparently didn’t come to all deserving children was an epiphany for me and one that has shaped my Christmas-keeping in the decades since. The Irish have a beautiful custom of having the youngest child light a candle in the window on Christmas Eve, lest Christ should come in the guise of a stranger. I count the strangers I have met during this time of year to be among my most treasured gifts. One year we were able to connect with a woman we read about in The Inquirer. She lead a group of fearless females who stood on the corner in their neighborhood with their mops and brooms to reclaim it from the drug dealers, and she often provided sanctuary to a dozen or more children in her home. Then there was the mother of the family we had adopted through the Visiting Nurses Association who selflessly offered a sleeping bag that she had requested to another mother who showed up at the center because she had nothing to give to her little ones. I generally avoid the mall as much as possible, but one year I was approached there by a stranger as I was enjoying a snack after a fruitful search for flannel sheets for my newly-separated father. Within a half hour I had learned about her painful spiritual journey through divorce and the sexual abuse of her children. Volunteers with Liberty Ministries pack Christmas gifts for inmates. That same year, my family traveled into Philadelphia for a performance of The Nutcracker. A young woman struck up a conversation with me (I am an avowed introvert and rarely initiate such encounters) as we waited on the platform at Market East for the R5 to take us home. Our conversation continued until she got off at the stop before us. She was a recovering drug addict trying to put her life back together. Her grandfather was dying in a nursing home in the area, and friends were taking her to visit him. He had believed in her even when she didn’t believe in herself, she explained. This year the world was too much with me, and I feared that Christmas might not come, “but it came just the same.” It came through offering a ride to an elderly woman in front of me in the check-out line at the Dollar Tree store who would surely have struggled walking home with her cane and packages. It came in attending a nursing home concert in which several members of my congregation performed. It came shopping with a neighbor for an immigrant family facing its first Christmas without a mother/wife/daughter/sister. It came helping to prepare nearly 2,000 brown paper packages for the inmates at Montgomery County Correctional Facility and having the privilege of joining others from Liberty Ministries in their distribution to the women who eagerly awaited them and gratefully received them. 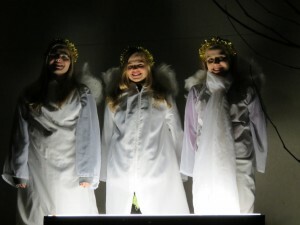 It came with a real “baby Jesus” in the pageant this Sunday and our own costumed angels poignantly drawing us in as we mourned the slaughter of the Holy Innocents in a sleepy New England town. Christmas. The celebration of God with us invites us all to be open to possibility and opportunities—to “deliver” Christ to a waiting world, to serve Christ among the least of these, and to be surprised anew by the ways Christ comes to us in the midst of our isolation and loneliness, our longing for things to be different, our busyness and self-absorption, and our grief and pain, our hopes and fears. 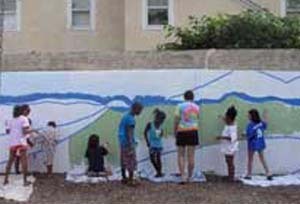 Ambler’s Kids Art Club paints a 44-foot mural. Ambler began in a garage in 1952 as an outreach of Franconia Conference. This mission was nearly abandoned when those who came to serve the children of the area found them too unruly. A decade later, a meetinghouse was built on donated land at the corner of Spring Garden and Mount Pleasant Avenues, within walking distance of the train to Philadelphia. In the last century Ambler grew as a company town for Keasbey and Mattison, an asbestos manufacturer. Despite this environmental legacy, Ambler is in the midst of revitalization with numerous restaurants, theaters, and shops opening on its main street. It’s first female mayor, a member of our congregation, was elected last fall. 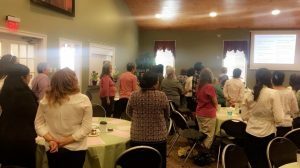 Ours is an average-sized congregation with leadership provided by a full-time pastor, a pair of elders, and a ministry team composed of a chair, five commission chairs, our Conference delegate, and the pastor that meets monthly. Our current pastor is the second woman in that position and was called from within. We continue to be a congregation with a focus on young people. This has included Vacation Bible School and a Kids Can Club, an art club that ran for several summers, hosting rock concerts featuring local high school bands, and sharing our space with the Ambler area Boys and Girls Club. Some of us regularly participate in prison ministry, gun shop and drone protests, and MDS work; others keep the situation in the Holy Land before us. We support the local food cupboard and Interfaith Housing and join with another congregation in May to shelter homeless families. We provide meeting space for a group trying to bring a food co-op to town. In recent years, we have become well known for our Pennsylvania Dutch dinners in the spring and a community flea market in the fall. Shoo-fly pies figure prominently in both. In a sermon titled Transformed Nonconformist, Dr. Martin Luther King Jr. wrote, “The saving of our world from pending doom will come, not through the complacent adjustment of the conforming majority, but through the creative maladjustment of a nonconforming minority” (Strength to Love, 27). To “Mennonite” is to be creatively maladjusted to a society that promotes materialism, nationalism, militarism, and violence. I was introduced to the Mennonite/Anabaptist perspective at Providence and Methacton more than thirty years ago. This was the era of Ron Sider’s Rich Christians in an Age of Hunger and Doris Jantzen Longacre’s Living More with Less. The lifestyle of simplicity and service such books advocated captured my imagination in a big way. My sister describes me to her friends as “almost Amish,” and, in some ways, I suppose I am. We decided to raise our children without Santa Claus or television. A clothesline replaced the dryer and kept us connected in some small way with the rhythms of the natural world. We built a little house in the woods and lived on one income so I could be a full-time stay-at-home mom until my daughters were in high school. Such non-conformity to the standards of culture is only possible if one takes Jesus seriously, not only on Sunday morning but in every encounter and experience throughout the week. This was something I saw modeled in the first “salt of the earth” Mennonites I met. Doing so means thoughtfully considering what following Jesus looks like in decisions big and small—the purchases one makes, the words one speaks, the actions one takes, how one spends his/her time. Should I spend a little more for organic produce? Do I really need that new dress? Can I skip that trip and take a walk instead? How do I speak the truth in love in this delicate situation? Will doing this honor/model Christ? To “Mennonite” also means taking community seriously. I was rebaptized and became a member of the Mennonite Church on my first wedding anniversary. One of the most memorable questions posed to me as part of this public confession was, “Are you willing to give and receive counsel in the congregation?” The mutual accountability and responsibility inherent in the question continues to remind me that we are in this relationship together. Everyone, I think, needs to have someone in his/her life who loves him/her enough to risk speaking the truth, however painful it may be. The vulnerability this demands of both giver and receiver is powerfully present each Holy Week in the simple act of kneeling before each other to wash feet. 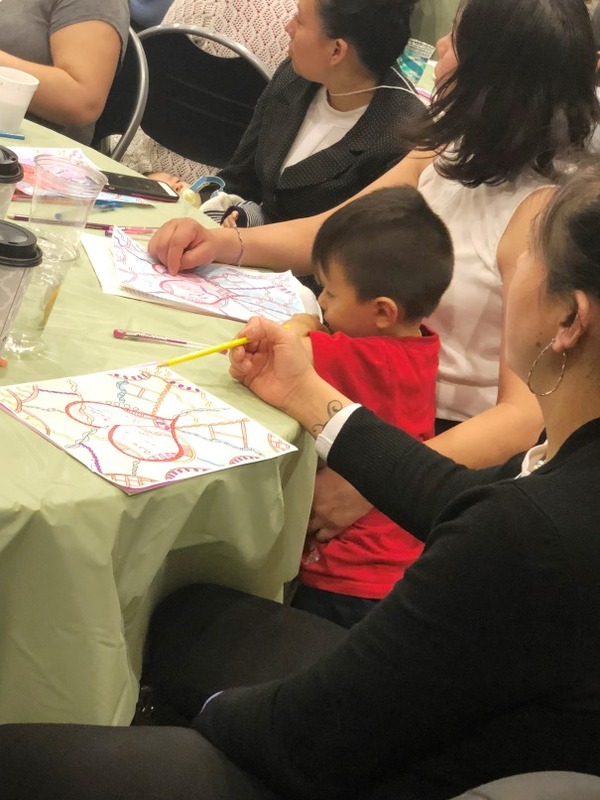 But the love symbolized in this annual ritual is evident throughout the year as we celebrate life’s milestones, care for children, prepare meals, clean houses, move possessions, offer advice, or listen with a sympathetic ear. This spring I did a six-week class on memoir writing at the Mennonite Heritage Center. Our last assignment included considering a possible title for our would-be memoir based on the writing we had done during the class. I called mine “Closet Rebel,” and the Mennonites are largely to blame. I am grateful to those who “Mennonite” at Ambler and Methacton for giving me the space and encouragement I needed for my quiet rebellion against the status quo. They have accepted me wholeheartedly, creatively maladjusted as I am. Next week, Noah Kolb, a forty-year minister in Mennonite congregations, will wrestle with his splintered heritage of faith and practice. How do you “Mennonite”? Join the conversation on Facebook & Twitter (#fmclife) or by email. Every year, followers of Jesus around the world join together in remembering his death and resurrection through the act of communion. World Communion Sunday is a celebration marking that through his death, Jesus broke down the wall of hostility between people groups and that through his resurrection, Christ formed a new family of disciples world-wide. 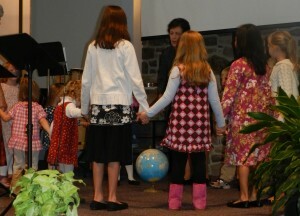 Swamp’s children encircle and walk around the globe singing “I am the Church” on World Communion Sunday. Photo by Abby Mason. Whether wearing clothes from countries around the world, as they did at Plains in Hatfield, Pa., or sharing a spaghetti dinner with the church down the street, as they did at Ripple in Allentown, Pa., Franconia Conference congregations spent October 2nd remembering this holy communion with the world-wide church. 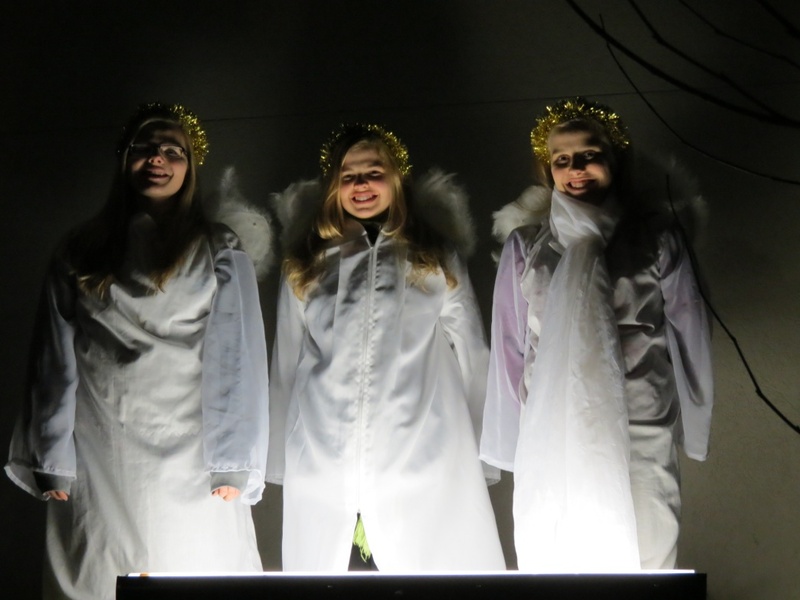 “This remains one of my favorite services of the year,” said Sharon Ambrose, a member of Swamp (Quakertown, Pa.). “I find it so meaningful to celebrate with Christians around the world.” In addition to sharing communion bread from other countries and reading Scripture in multiple languages, Swamp’s service focused on expanding circles of concern from the congregation to the world, both locally and globally. Church elders pray behind the communion table at Nueva Vida Norristown New Life. Photo by Emily Ralph. Souderton (Pa.) Mennonite Church celebrated with the theme of hospitality from Acts 2, which describes how the early church worshiped and ate together, sharing their possessions. 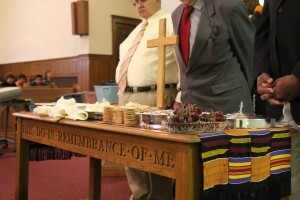 The congregation used a braided bread of different colors to remind them that people from many nations were celebrating the Lord’s Supper with them. As members of the congregation approached the communion tables, they were joined on the big screen by photos of people celebrating communion around the world. 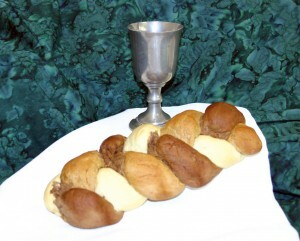 Souderton used a braided bread to remind them that people from many nations were celebrating the Lord’s Supper with them. Photo by Alyssa Kerns. Edward Albee wrote, “Sometimes it’s necessary to go a long distance out of the way in order to come back a short distance correctly.” This describes my journey to pastoral ministry. In the seventh grade an aptitude test indicated “nun” as a suitable career choice. This is not what most adolescent girls dream of becoming, especially if they are Protestant. It took me decades to realize that there were few other options available in 1970 to young women with a decidedly religious bent and even longer to answer the call to pastor. I went to college, dropped out, got married, raised two daughters, finished my bachelor’s degree, was diagnosed with early stage cancer, began a teaching career, earned a graduate degree in education and became a grandmother. All the while I was actively involved in churches—Methodist, Baptist, Mennonite (where I was rebaptized thirty years ago), Episcopalian, Presbyterian—and the communities they served. Many people along the way encouraged me to consider seminary (none more persistently than former Ambler pastor Mel Thomas), but I always had a ready excuse. For twenty years I was a stay-at-home mom with an incomplete degree and lots of time to invest in the lives of young people through the scouting and Odyssey of the Mind programs. By the time I finished my undergraduate work, my firstborn was beginning her’s; her sister was four years behind. As a first generation college graduate, I wanted this to be the best possible experience for my girls. Although I had been collecting catalogues from area seminaries, the timing did not seem right. After our youngest graduated, I was able to spend several months trying on a pastoral role when Sharon Wyse Miller was granted a sabbatical. I wanted to see what it was like to prepare and deliver a message each week before I could seriously entertain the idea of attending seminary full-time. It was a wonderfully rich summer for me as I applied many of the pedagogical techniques I had practiced in the classroom to Jesus’ teaching through parables. At its conclusion, I wrestled with God about seminary. I learned two important lessons from my undergraduate experience that informed my decision. The first was that I could not study in isolation; I needed to have one foot in the “real” world. The other was my desire for face-to-face interaction. I am an introvert by nature, so while distance education was comfortable and rewarding, it did not afford the opportunities for growth that I needed. I found a good fit with Biblical’s LEAD MDiv degree. An alternative program designed for working adults, this allowed me to continue teaching and to build relationships with the members of cohort 12 with whom I have all of my courses. I am old enough to be my classmates’ parent, but we enjoy a symbiotic relationship. I have the life experience and they have the tech savvy. It has proved to be a winning combination. With only a year of seminary completed, I did not expect to be looking for a position in a church for several years, but God had other plans. Sharon announced her planned retirement at the end of August at our January congregational meeting. Her announcement prompted me to complete the necessary paperwork to be considered as a candidate. A month later, I learned that I would not have a job come September. The economic downturn made it necessary to cut my position at school. Unemployment made it necessary for me to trust God’s providence and possible to see the search process through to completion. It also freed me to do many things grading papers never allowed time for—a week at camp with special needs adults, putting siding on a Habitat house, helping to build a playground. On October 4, the congregation that I have called “home” for a decade called me as its next pastor. It has been a long and convoluted path to pastoral ministry, but my installation service on November 8 confirmed that this is where I belong. I am excited by the possibilities before us as we live out the Gospel and respond to Christ’s missional call here in Ambler and beyond. Thanks be to God!